The Star Thistle Leading Edge Project, a collaborative effort involving state and federal agencies and UC Cooperative Extension, is facing a lack of funding, reported Matt Weiser in the Sacramento Bee. The project was funded by the state Department of Food and Agriculture as part of its weed control budget totaling $2.7 million in 2011. That money was cut from the 2011-2012 state budget cycle. 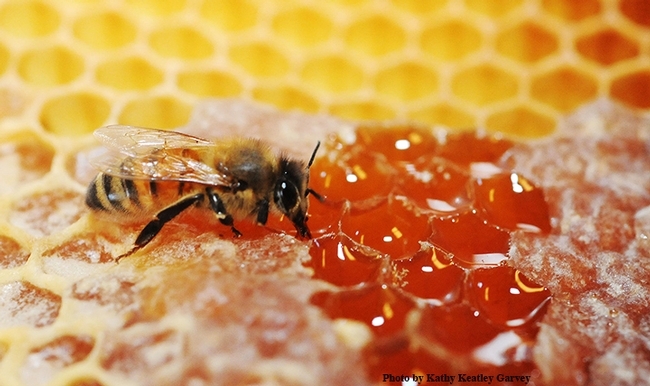 Local and federal grants that kept the program going will run out next month. A $314,000 grant from the Sierra Nevada Conservancy was denied because the group failed to meet the application requirements, the article said. These developments may give starthistle a bigger hold on California wildland. The roots of the nuisance weed grow as much as six feet deep to find moisture. "It would be as if these areas are experiencing drought because of the amount of water it uses," said Joe DiTomaso, UC Cooperative Extension specialist in the UC Davis Department of Plant Sciences. 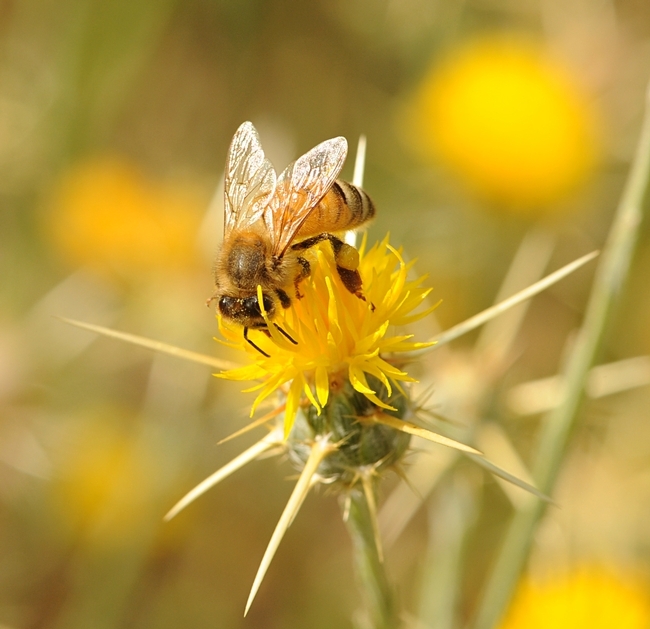 DiTomaso is a leading expert on starthistle. 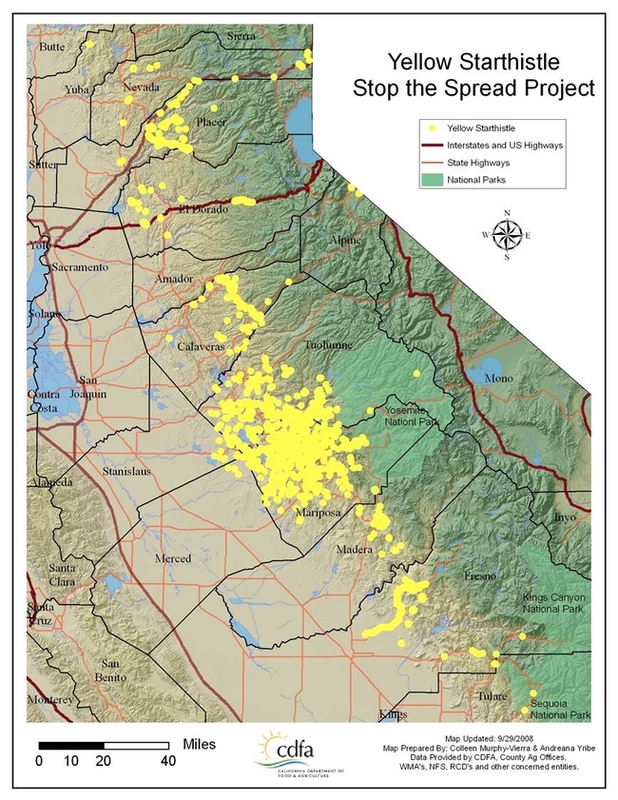 The Leading Edge Project started about a decade ago with a mapping effort to find out just how much of the state was infested with starthistle, and where it was spreading, said Wendy West, the project's coordinator and a University of California Cooperative Extension program representative based in Placerville. "It felt like such a losing battle that we really needed to prioritize what we could do and how we could be successful," West said. "I've personally pulled plants at 7,000 feet in Alpine County," West said. "It may not move quite as fast, but yellow star thistle is a really good example of a plant that can adapt to new locations easily." Weeds, weeds, weeds! Have you noticed? This has been a banner year for weeds. Puncturevine where I’ve never seen it before. Garden soil covered with common purslane (at least it’s good in salads). And solid stands of yellow starthistle everywhere! Our cool late spring and repeated late rains created multiple germination periods; weed seeds in the soil had many opportunities to sprout. And sprout they did! With the heat of summer, weeds flowered and became noticeable. Now, weeds have set seed and dried along roadsides, in fields, and landscapes. All those weed seeds will require diligent effort next spring! It’s time to plan your weed attack to prevent next year’s seedlings. What can be done? First of all, identify your weeds. Different weeds require different treatments. Is it an annual or perennial? Does it propagate by wind-blown seeds or by runners? 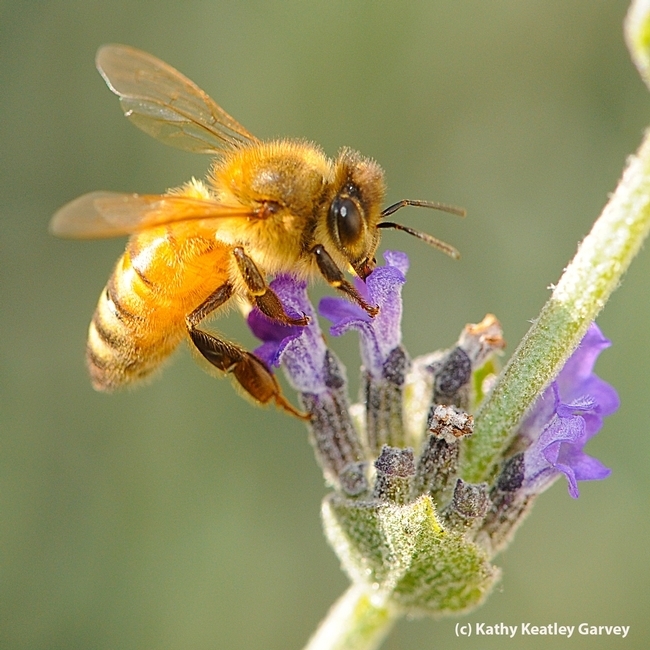 The University of California Integrated Pest Management website, has weed-identification guides that are fun and easy to use. The website also offers treatment guidelines. In the California foothills, yellow starthistle (YST) is perhaps the most common weed of concern. It impacts much of our open space - agricultural and rangeland - and intrudes into our neighborhood landscapes. Yellow starthistle currently infests more than 15 million acres of land in California. Not only does it prevent recreational use, like walking or hiking, but it chokes out native grasses and wildflowers. It is also poisonous to horses, causing a neurological disorder called "chewing disease” which can be fatal once symptoms develop. More and more, individual homeowners are becoming the key to containing and eliminating this invasive plant, wherever it exists. 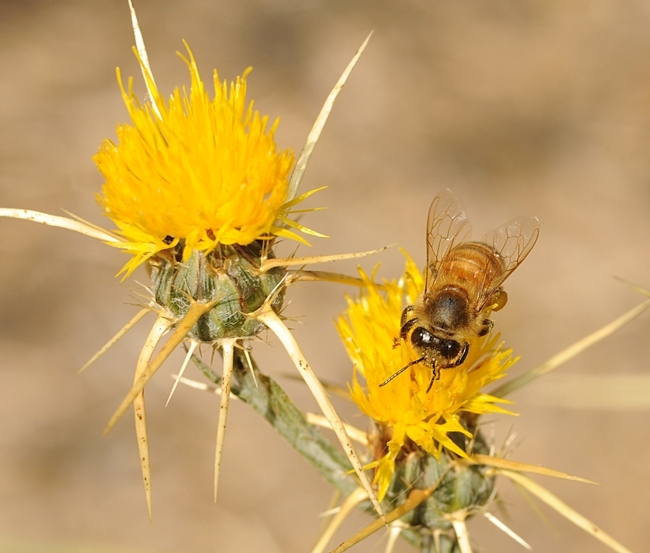 The goal in treating yellow starthistle is to prevent seed formation. Unfortunately, this year's YST has already bloomed, set seed, and dried. Planning is essential to prevent another banner crop next year. That said, yellow starthistle can be hand-pulled at any time in its lifespan. In its present dry and spiny stage, pulling the weeds can inflict pain, so be sure to wear gloves. Double-bag the plants and burn them later in the fall. There is a fairly new herbicide (2009) on the market from Monterey Chemical called Star Thistle Killer. It is available at home centers and nurseries and can be purchased without a permit. The active ingredient, clopyralid, is the same active ingredient in Transline and should not be used on lawns. However, one spray application on small parcels of less than two acres during the late fall, winter, or early spring rainy season will be effective in preventing yellow starthistle seedling germination next spring. 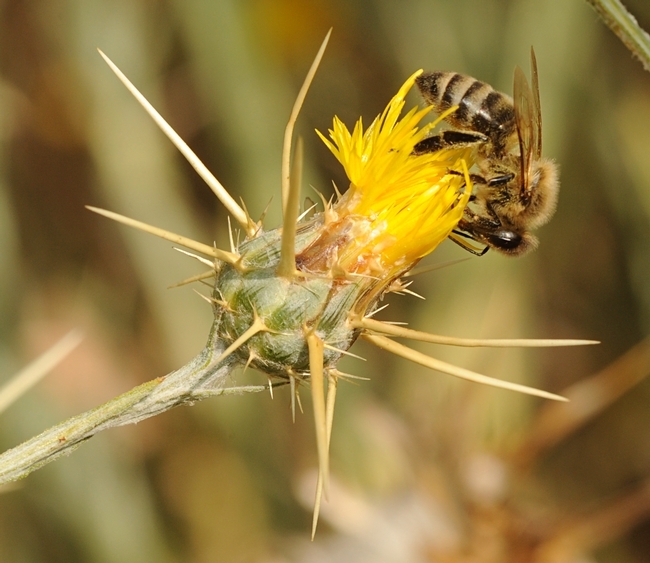 Local pest control companies are also available to provide a one-time herbicide application for yellow starthistle. 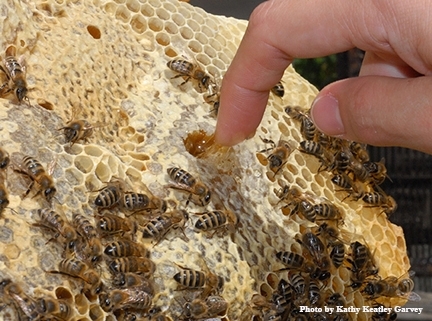 For more information, go to the Central Sierra Cooperative Extension website or call the Yellow Starthistle Leading Edge Project in the UC Cooperative Extension office at (530) 621-5533 or (209) 533-6993. Information adapted from the University of California Integrated Pest Management Program and from “Yellow Starthistle: Brief Homeowner Information Sheet” by John E. Otto, Amador County Master Gardener. Also see the following video on yellow starthistle control. Goats have large livers that allow processing of compounds less digestible or more toxic to other grazers. Goats' penchant for eating almost any plant material can make them a valuable management tool for landowners faced with a yellow starthistle infestation. Yellow starthistle is thought to have been introduced into California from Chile during the Gold Rush. The weed readily took hold in California valleys and foothills, thriving in areas where the soil has been disturbed by animals grazing, road construction and wildland firebreaks. Today, yellow starthistle is a very common sight in vacant lots and fields, along roadsides and trails, in pastures and ranch lands, and in parks, open-space preserves and natural areas. Deep tap roots allow yellow starthistle to thrive during hot, dry summers. 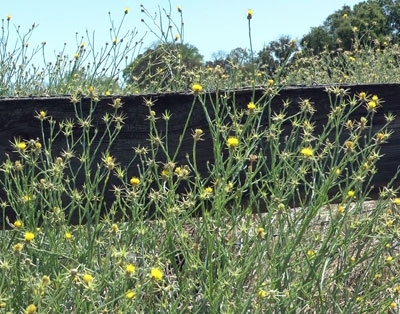 Large property owners use a variety of methods to control yellow starthistle - chemical, mechanical and biological - but UC scientists believe individual homeowners are a key to containing and eliminating this invasive pest. That's where goats can come in. 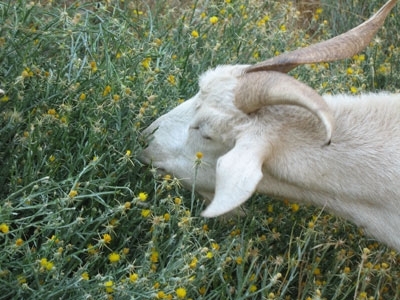 Goats will eat yellow starthistle at all phases of growth, including the mature, spiny stage, when it is not palatable to other browsers and grazers. 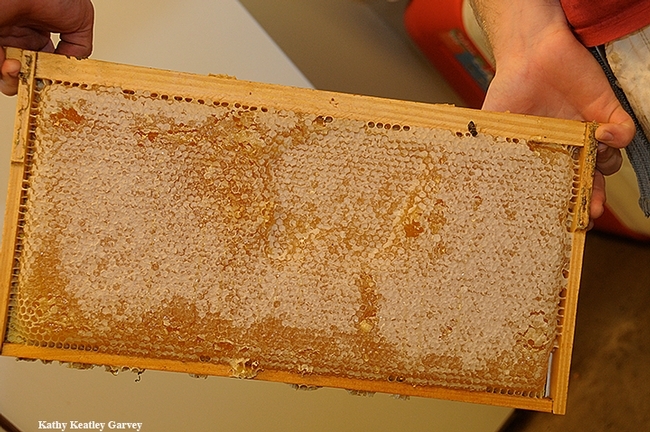 "When goats eat yellow starthistle, they open up the canopy and allow sunlight to hit the ground," said Roger Ingram, UC Cooperative Extension natural resources advisor. "That allows other, more beneficial seeds to come up and grow. If you can get other plants growing in there, the competition will choke out yellow starthistle." Landowners can raise goats themselves and direct them to areas of starthistle infestation with portable fencing, or they can lease the animals exclusively for vegetation control. 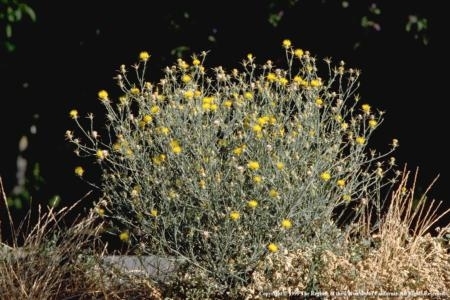 More information on yellow starthistle management is available from the UC Integrated Pest Management Program. View the video below for more information on goats' browsing preferences. Read a transcript of the video.